CarPal – Community Rideshare — "Uber for Shut-in Seniors"
How would you feel if you were trapped in a coffin and … no one could hear you? Did you know that there are around 1065 people in The Hills who deal with isolation, uncertainty and hopelessness every day of their lives? Imagine how you would feel if one of them was your grandmother! It’s quick, simple and fun to lend a helping hand, in as little as 5 minutes! 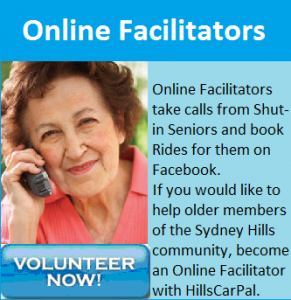 In 2008, John McQuarrie, a long-time Sydney Hills resident, saw the plight of local seniors as he volunteered to drive them to their medical appointments, grocery shopping and cemetery visits, when no one else would. Community transportation services don’t take seniors across town, or anywhere on weekends or at night. Seniors are required to give plenty of notice to book a trip, which means they often miss out on the spontaneity that life demands, and the simplest flexibility and freedom that so many of us take for granted. You can make sure that no more seniors have to suffer Shut-In Syndrome! To find out how you can help stamp it out easily and with as little as 5 minutes of your time, simply subscribe and we’ll email you with some obligation-free, quick and easy information.